“Good luck traveling more than 100km,” they might say. They then may go on to mention something about electric cars being slow, frustrating to drive and really not being that good for the environment, before jumping into their massive, gas-guzzling SUV. While I can’t debunk every myth surrounding EVs, I can say that, depending on your transportation needs and where you live in Canada, it’s now possible to easily use a battery powered car as your daily vehicle as long as you’re willing to put in a little extra effort. Given that this is my first experience with an electric car, I now have an entirely new perspective on the technology. Contrary to what some might assume, you also don’t need to opt for a pricey Tesla either — though the company’s Supercharger infrastructure remains impressive. It’s worth noting that beyond the 2018 Leaf, which is the main focus of this story, there are a variety of other capable EV cars out there, including the Chevrolet Bolt and well-reviewed Hyundai Ionic. Neither of these vehicles would even come close to falling into the luxury automobile category like other higher-end EVs, but they’re still capable electric cars that easily rival the 2018 Leaf. 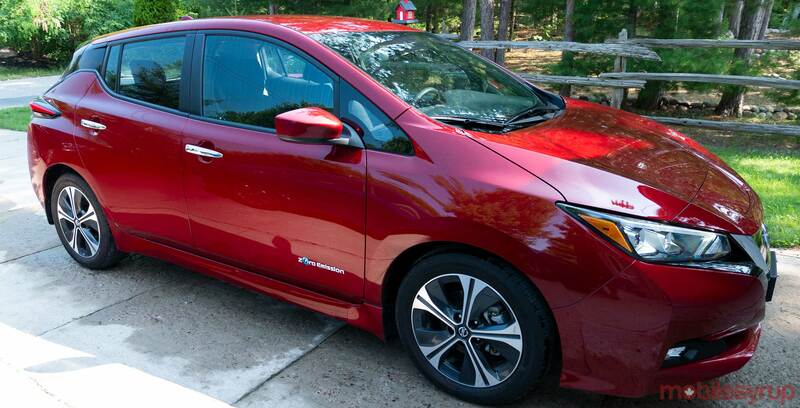 I spent roughly a week-and-a-half this summer driving a 2018 Nissan Leaf, a sleek hatchback that, to my surprise, could easily pass for a gas-powered vehicle with its performance and looks. It seems the era of putting up with an off-putting aesthetic as part of owning an electric car is a thing of the past. In terms of range, the 2018 Leaf is capable of traveling 242km on a single charge and features a new e-powertrain with 139 horsepower. Further, the 2018 model now includes a 110kw EV motor and 40kwh battery, resulting in the vehicle having 37 percent more horsepower and 42 percent more range than last year’s Leaf. 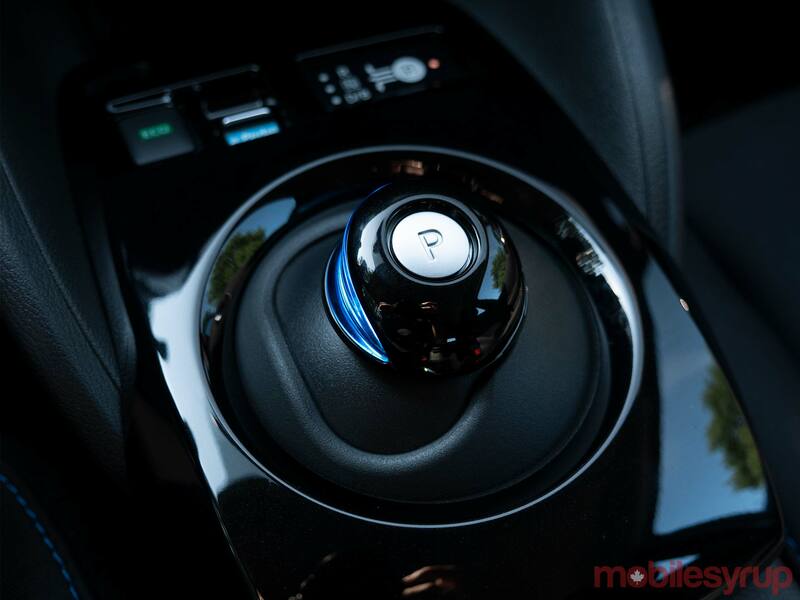 In practice, this means the Leaf handles precisely as you would expect any car to. I’d even go so far as to describe the experience of driving the Leaf as a little more responsive than my 2014 Ford Fiesta, a similarly sized and capable gas-powered hatchback. Concerning actual distance, with the air conditioning pumping and a phone charging and plugged into the vehicle’s infotainment system, I found I’d typically get about 230km out of the leaf, as opposed to Nissan’s advertised 242km. While some might find this number disappointing, it’s better than I expected given that in the world of smartphones, handsets rarely meet a manufacturer’s promised battery life. The specific model of Leaf I spent time with was the SV edition, which is priced at approximately $40,000 CAD. Given Ontario’s EV rebate offer is no longer available thanks to the province’s new Progressive Conservative government, this is the actual price of the car in Ontario. Previously it was possible to get roughly $14,000 off the Leaf in Ontario, putting the car in the same price range as other affordable entry-level sedans and hatchbacks. Other Canadian provinces still have EV incentives though, with Quebec offering up to $8,000 off the purchase of an electric vehicle and British Columbia also offering various electric vehicle incentives. The SV version of the car also features ProPilot Assist, Nissan’s lane guidance system that maintains the distance between the vehicle in front of you, while also staying in between lanes. Your hands always need to stay on the wheel, with the car emitting aggressive beeping noises if you happen to let go. 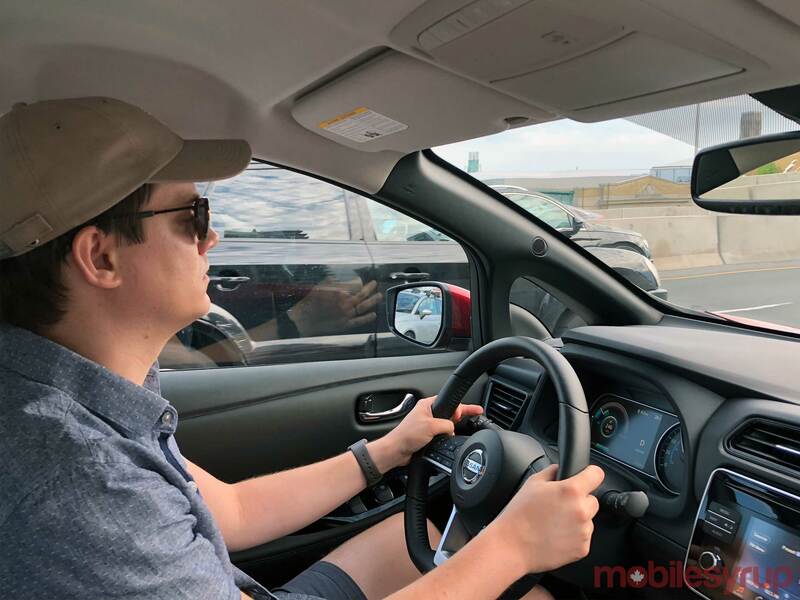 While useful on long drives and relatively common in most newer vehicles at this point, I found that I rarely used ProPilot Assist, though the feature does seem quite capable as long as the weather is clear and lines are visible on the road. 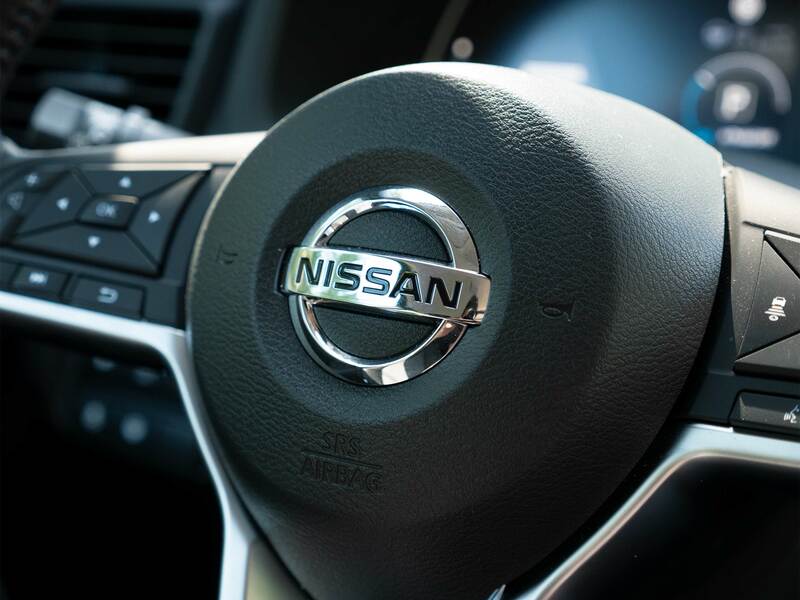 There’s also a NissanConnect EV telematics app for Android and iOS that offers useful information about the vehicle’s current status, including battery life. 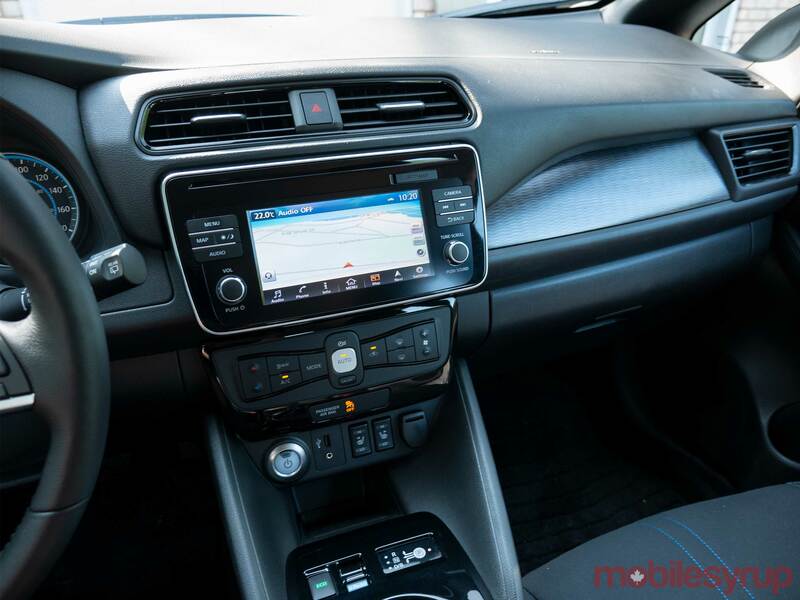 The app also allows users to remotely turn on the car’s air conditioning, though I found it unnecessary given the amount of information packed into the Leaf’s dashboard. Speaking of the centre display, the car features a detailed screen that shows battery life, along with a useful marker on the speedometer that suggests how to most efficiently utilize the car’s battery based on your acceleration and speed. I found that in most cases I was able to hit this mark, but that rapid acceleration rapidly pushed the meter out of the optimized zone. Then there’s the e-Pedal, a battery regenerative breaking method commonly found in most EVs. The way the e-Pedal works is a little difficult to describe if you haven’t used one before. When you push it down, just as you would with a car’s gas pedal usually, the vehicle accelerates, but when you let up on it, the car slows down. To be clear, this is accomplished with a single pedal, which is a strange feeling given vehicles are typically driven with an individual gas and brake pedal. While not a feature I’m comfortable with given most of my driving is done in a stop and go city environment, I could see the e-Pedal being useful in a highway driving situation where you’re rarely applying the brake. Thankfully, the e-pedal can easily be turned on and off with the press of a button. 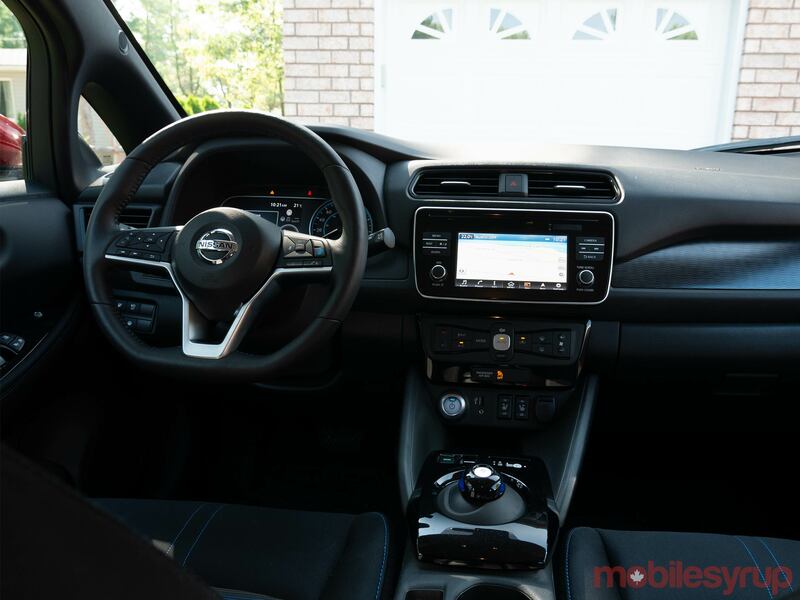 The Leaf’s infotainment system is also capable of running both Android Auto and CarPlay, another set of features that are becoming increasingly common even in entry-level vehicles. 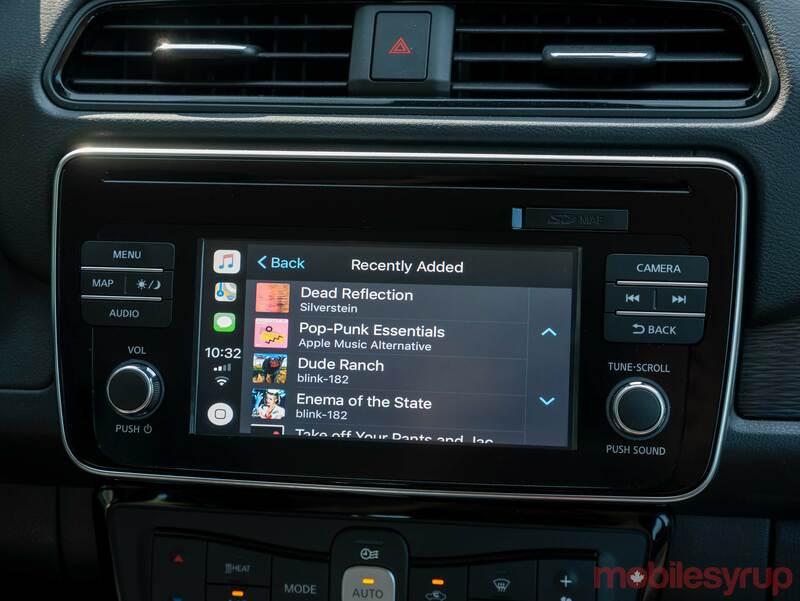 While both platforms, particularly CarPlay, are significantly more capable than any in-car infotainment system I’ve encountered, they also remain disappointing and fail to provide a reliable experience that lives up to their smartphone namesakes. 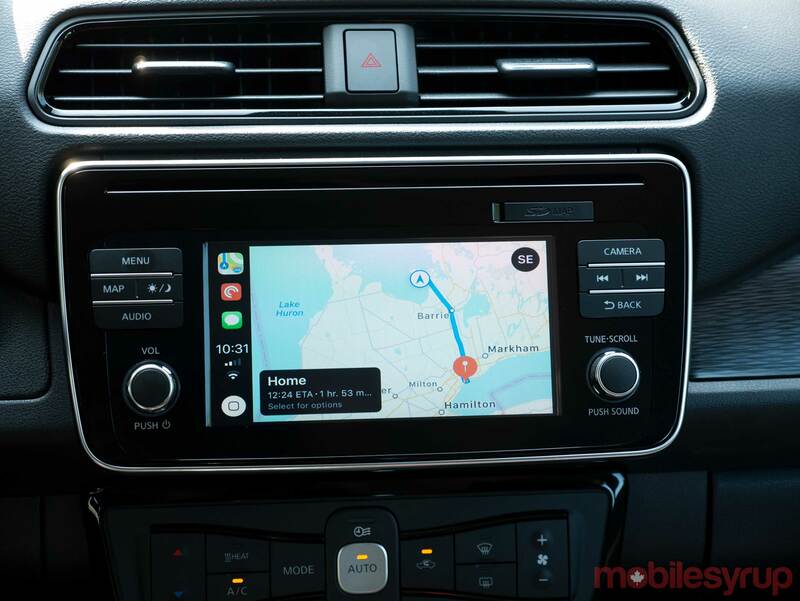 Perhaps my expectations were just too high when it comes to Siri and Google Assistant’s ability to understand my voice commands when on the road, but after the fifth time Android Auto crashed on me, I switched to primarily using the Leafs built-in dashboard during my time with the vehicle. I will say that Apple Music integration through CarPlay is pretty great. Finally, while not directly related to the 2018 Leaf’s ability as an electric vehicle, I found the car’s seats to be incredibly uncomfortable, as well as the front window to be angled strangely. I’d describe the experience of sitting in the Leaf as being similar to sitting on a hard kitchen chair, which is in stark contrast to how snappy the car actually handles. Charging is likely the main question most people have when it comes to electric vehicles. I was pleasantly surprised with how easy the entire EV charging process is, even though it looks intimidating at first. First, let’s go through the options for charging an electric vehicle, which are split into three distinct categories. 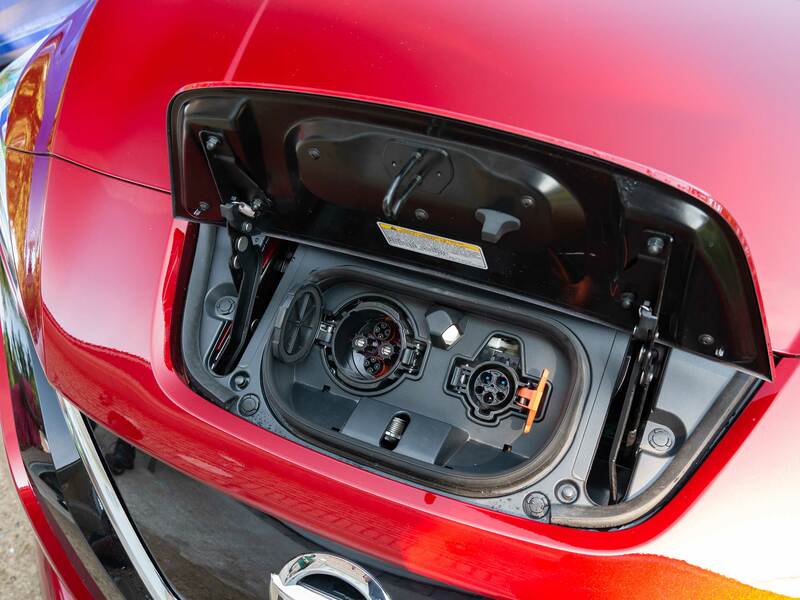 According to Nissan, when using a Level III CHadeMO DC charger, the Leaf is capable of going from zero to 80 percent battery capacity in roughly 40 minutes. Every 2018 Leaf sold in Canada features this charging port, along with an additional plug capable of both Level 1 and Level 2 charging. The plugs are located in the front of the vehicle under a hatch where the latch to open the vehicle’s hood would typically be found. You won’t be able to use DC charging at home and instead will need to pull up to a charging station and fork over cash. In my case, there was a CHadeMO charger roughly 10 minutes from my apartment at a local mall, with the price coming to $20 per hour. Compared to other forms of charging, CHadeMO is more expensive — though it’s still well under the cost of gas — and I would only use it in specific circumstances. For instance, before driving from Toronto to my parent’s place north of Barrie, Ontario, I decided to charge up the Leaf, which was sitting at roughly 20 percent battery capacity at the time. In less than an hour, I was back up to 100 percent battery power thanks to the DC charger. 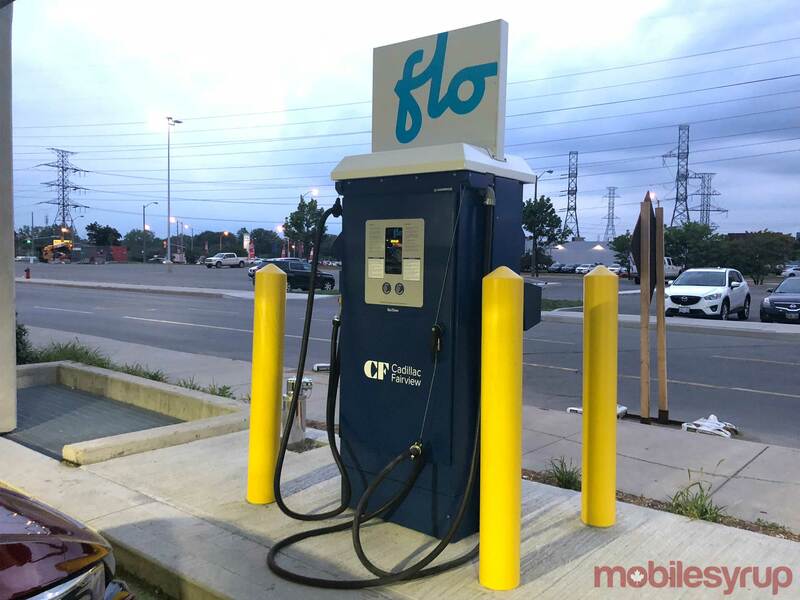 The process of paying for the charge through Flo was also as easy as signing up for an app, inputting my credit card information and selecting the nearby charger. Next, there’s Level II 240v charging, which typically results in 30KM of range for roughly one hour of charging. This type of charger is easy to install at home as it’s the same as the type of plug used for a stove, resulting in it being one of the most commonly found charging stations across Canada and North America. Level II Charging stations offered by companies like ChargePoint seem to feature slightly higher voltage when compared to at-home setups, resulting in charging that’s a little bit quicker. Prices vary significantly, but in most cases you’ll only end up paying a few dollars for a couple hours of charging. Level 1 charging, the slowest of the three available options on the Leaf, creates 8km of charge for one hour through a basic wall plug. In most cases, given I was driving the 2018 Leaf the roughly 30km to and from work, this is the form of charging I opted for. Every day, except for a situation where I was planning to travel roughly 175km that evening, I found that this form of charging topped up the Leaf enough to use it as a commuter vehicle. Given that I live in an apartment building, hunting down an available wall plug to use Leaf’s included Level 1 charging adapter was more difficult than I expected, though I eventually found one in the guest parking area. Unfortunately, the building’s management wasn’t pleased with this and at one point attempted to charge me for the tiny amount of energy I used during an overnight charge, despite the wall plug being a common element of the condo. Most newer buildings should feature some sort of EV charging station, so this won’t be an issue for most. 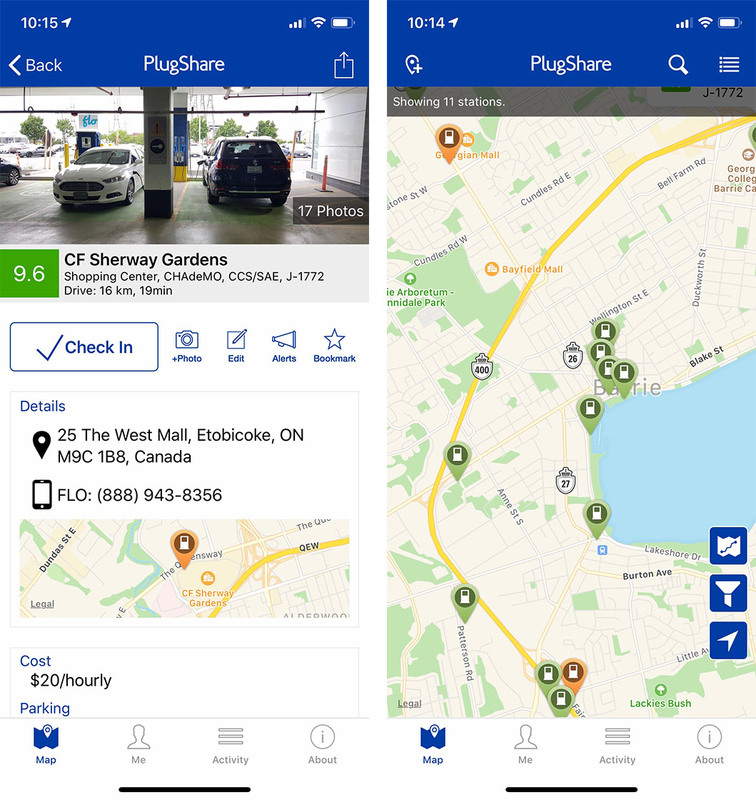 To find local charging stations, as well as to plot my route from my apartment in Toronto to my parent’s house north of Barrie, a drive that amounts to a little over two hours, I used a crowdsourced app called PlugShare. PlugShare, which is available across iOS, Android and desktop, allows users to look up plugs owned by EV charging networks like Flow and ChargePoint, as well as private charging locations added to its database by users. The first time I drove the Leaf I was admittedly concerned the vehicle’s battery would suddenly overheat or drop to zero, leaving me stranded and in desperate need of a charger that I just wouldn’t be able to find. I quickly realized that just isn’t the reality when it comes to current charging infrastructure in most populated areas of Canada. With the help of the Leaf’s built-in charger finder, or a more capable app like PlugShare, I never really felt like a charger was that far away. That said, EV chargers are far from being as prevalent as gas stations, especially along major highways, though they are slowly getting there. It’s important to keep in mind that I live in southern Ontario in Toronto where EV charging ports are becoming increasingly common. If you happen to reside in a more rural or isolated area of the Canada, a quick look at PlugShare reveals that you’ll have a vastly different experience charging an EV. Further, in order for an electric vehicle to be a viable transportation option, you can’t treat charging an EV in the same way you would a gasoline-powered vehicle. Constant top-ups are necessary, rather than a weekly, or depending on how often you use your car, almost daily trip to the gas station. If you head to the mall, park in an EV spot and take advantage of the available Level 2 EV charging stations — maybe your office even has a free EV charging port. Finally, charging overnight is also a necessity if you intend to use your car a commuter vehicle. Electric vehicles have come a long way in a relatively short period, contrary to what some people may still firmly believe. That person mentioned above who scoffs at the concept of a car not powered by burning gasoline, likely won’t be convinced quite yet, though an EV technology inflection point has certainly been hit. For myself in particular, the price of an EV remains the biggest purchase barrier, but hopefully that changes over the next few years. You likely couldn’t head out on a cross-country road trip in an EV without a significant amount of planning, but even after roughly only a week with the 2018 Nissan Leaf, I feel that I could easily replace my gas-powered car with a modern electric vehicle.